The following document contains two attachments which have been posted separately below for easier access. 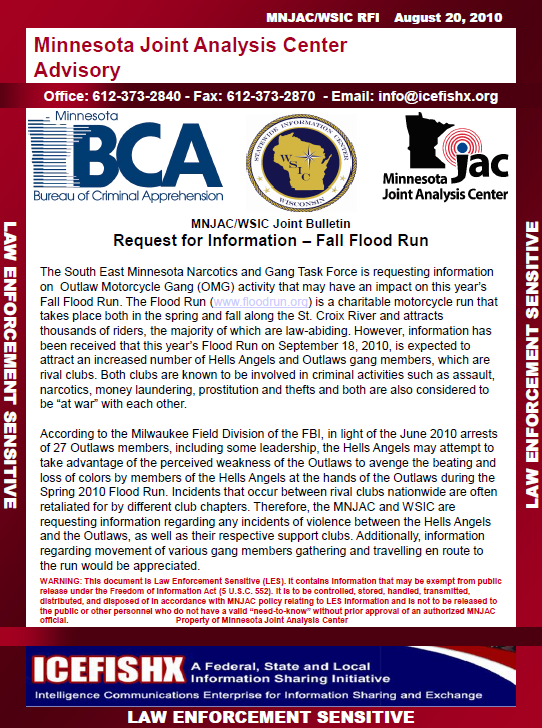 The South East Minnesota Narcotics and Gang Task Force is requesting information on Outlaw Motorcycle Gang (OMG) activity that may have an impact on this year’s Fall Flood Run. The Flood Run (www.floodrun.org) is a charitable motorcycle run that takes place both in the spring and fall along the St. Croix River and attracts thousands of riders, the majority of which are law-abiding. However, information has been received that this year’s Flood Run on September 18, 2010, is expected to attract an increased number of Hells Angels and Outlaws gang members, which are rival clubs. Both clubs are known to be involved in criminal activities such as assault, narcotics, money laundering, prostitution and thefts and both are also considered to be “at war” with each other. 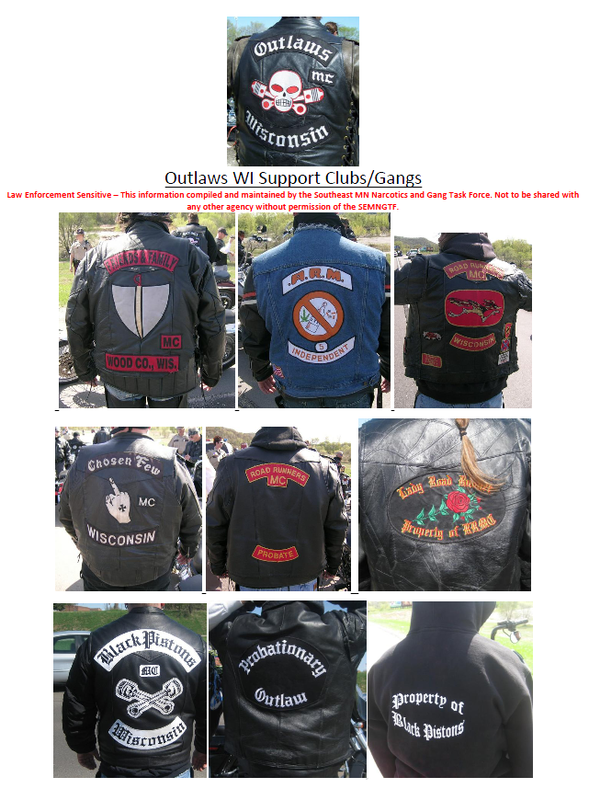 According to the Milwaukee Field Division of the FBI, in light of the June 2010 arrests of 27 Outlaws members, including some leadership, the Hells Angels may attempt to take advantage of the perceived weakness of the Outlaws to avenge the beating and loss of colors by members of the Hells Angels at the hands of the Outlaws during the Spring 2010 Flood Run. Incidents that occur between rival clubs nationwide are often retaliated for by different club chapters. 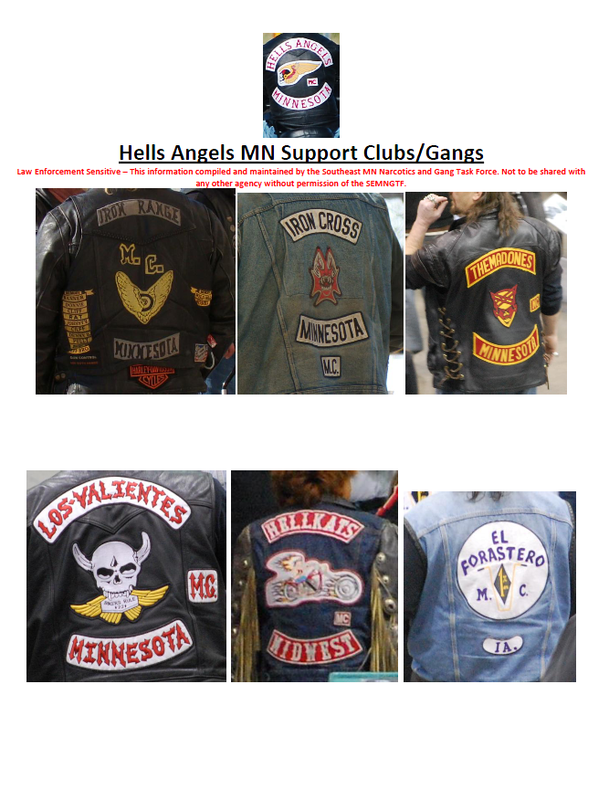 Therefore, the MNJAC and WSIC are requesting information regarding any incidents of violence between the Hells Angels and the Outlaws, as well as their respective support clubs. Additionally, information regarding movement of various gang members gathering and travelling en route to the run would be appreciated. Any contact with biker gangs should be considered a high risk situation due to the increased likelihood of all members being armed in anticipation of any retaliation stemming from recent incidents. Please share this bulletin with your law enforcement OMG investigators in your jurisdiction.